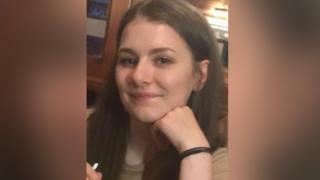 Police searching for missing Hull student Libby Squire have confirmed a body recovered from the Humber estuary is that of a woman. Post-mortem tests on the body, which was found close to Spurn Point on Wednesday afternoon, are taking place. Humberside Police said there had been no formal identification but "we have been in contact and informed those that needed to be made aware of the recovery". Ms Squire was last seen on 1 February. The 21-year-old University of Hull philosophy student, originally from High Wycombe, Buckinghamshire, was seen just after midnight at the junction of Beverley Road and Haworth Street in Hull following a night out. The body was recovered at around 15:30 GMT on Wednesday and taken to Grimsby Docks, police said. The post-mortem is expected to last for the rest of the day. Humberside Police said: "Formal identification is still yet to take place and we remain unable at this stage to confirm her identity." Hundreds of uniformed officers and around 50 detectives have been searching "around the clock" for Ms Squire, with specialist search advisors, underwater officers, the fire service, police dogs, local businesses and the public also involved. Pawel Relowicz, of Raglan Street, Hull, is remanded in custody on unrelated charges of burglary, voyeurism, outraging public decency and receiving stolen goods. They do not believe she entered the house and have said her phone "has not provided any further insight as to her movements that night". Her family said they miss her "beyond belief".